Once he puts a ring on it, all the fun begins! So excited to be sharing my first Wedding Wednesday post! 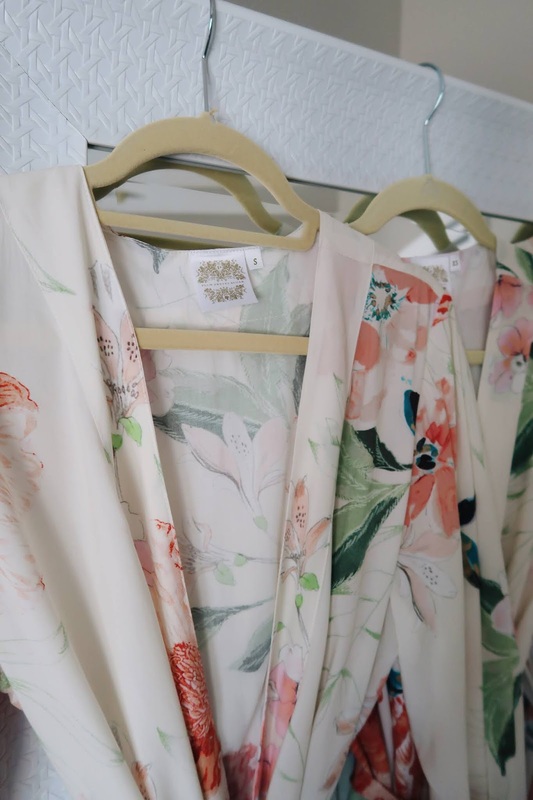 Special thanks to BHLDN and Minted for providing product for this post. As always, all opinions are my own. The very first thing we nailed down was our wedding venue (working on a separate post for this), and then it was time to alert the wedding party. 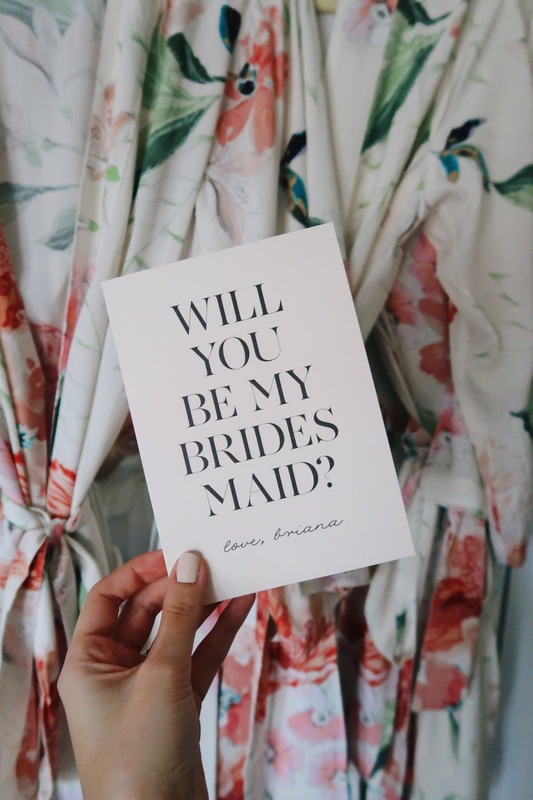 Asking your bridesmaids to be in your wedding is an exciting time! There are truly so many different ways you can ask them, it just depends on your budget and how many are in your party. If you only have a few ladies in your bridal party, it's easier to splurge on more expensive items. But once you get to five bridesmaids or more, things can start to add up quickly. I loved working with my friends at BHLDN to gift some gorgeous items to each of my girls! I made six boxes for my maids of honor and bridesmaids, and I spent around $150 in total (about $25 per box). Not bad right? There are a bunch of places online that will help you create boxes and ship them for you. However, most of these start at around $50+ per box. I found it more economical to make my own, plus I loved being able to truly customize the items to match my vibe. Do I want to give them in-person or ship them? More than half of my bridal party lives in other cities or states, so giving them all in-person wasn't exactly an option for me. Thankfully, I decided to give them around the holidays, so I was able to catch a few of them while they were in town! Why is this important? Well, depending on what you're situation is you may have to reconsider what goes into boxes due to weight or shipping constraints. It is actually illegal to send alcohol in the mail, however FedEx does allow this for those of you that may want to include small champagne bottles or other drinks. Are you shipping anything fragile? I sent small candles in mine and bubble-wrapped them like CRAZY (you can ask the gals in my bridal party that got their boxes in the mail, it was serious unwrapping). Also you will need to factor in shipping costs into your overall total. Depending on the time of year that you send the boxes, be sure to keep the weather in mind. I wouldn't recommend shipping anything chocolate or perishable during the summer months, as you run the risk of things melting or ruining items in the box. Also keep this in mind for shipping timelines. If you're shipping something perishable you'll want to choose a faster option than ground or standard delivery, and you should make sure that your bridal party will be around to retrieve the package once it's delivered. Same thing in every box? 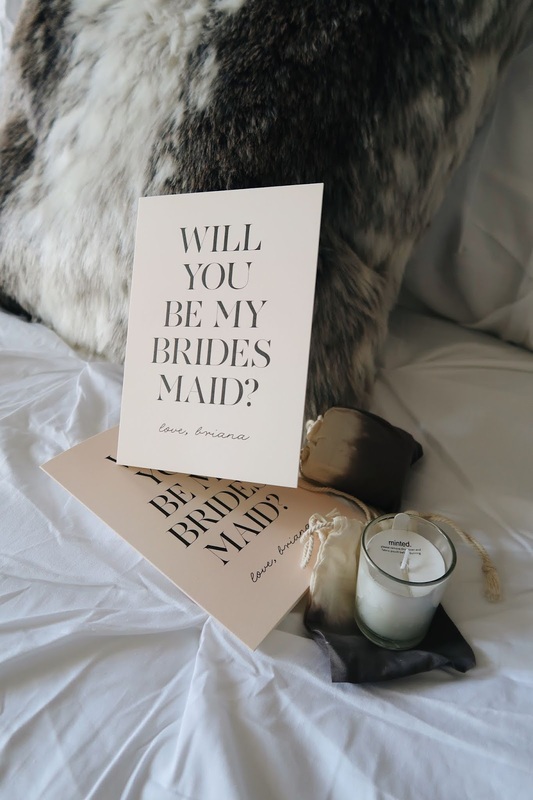 It's entirely up to you if you want to change up the items in each box to match the person you are sending to, or potentially sending different items to maid of honors and bridesmaids. I opted to have the same thing in every box, so I tried to choose items that everyone would love in the boxes. Will I be giving them other gifts? In my case, the answer is YES. I plan to give my bridal party gifts at the bridal luncheon, bachelorette party and on the wedding day. So I decided to keep these simple knowing that I have a bunch of other gifts coming their way - truthfully, I'm more excited about a lot of those! So how did I make it affordable? Rather than paying $7-$8 for a decorative box (that I would then have to stuff inside another shipping box that I'd pay for), I went to my nearest office supply store and found some solid white shipping boxes. I bought a pack of six boxes for $10. I lined them all with a few layers of bubble wrap and then stuffed them with paper filler to make them look nicer. I was able to find white filler on sale at the craft store around the holidays. For the items inside my boxes I selected black and white candles, light blue bath bombs, mini champagne bottles, Ferrero Rocher chocolates, a custom card, and a jewelry bag that said "I Do Crew" to hold their baubles on the wedding day. 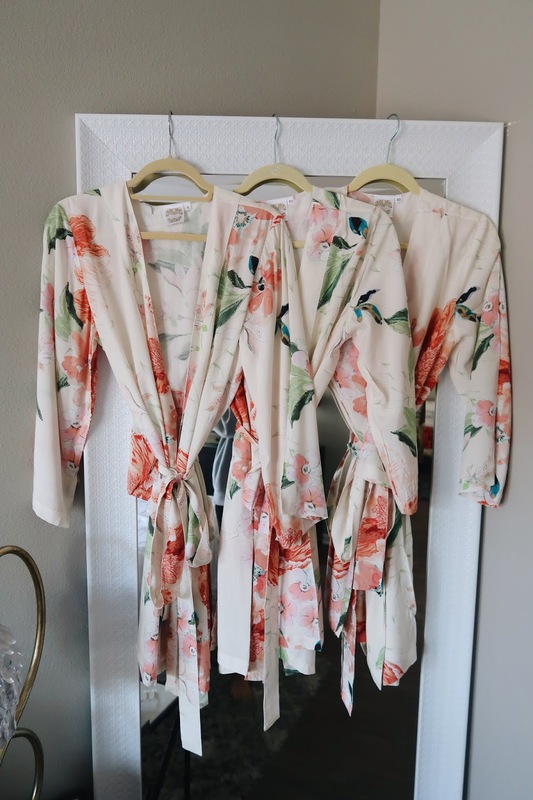 I also had these beautiful robes from BHLDN!! They are going to look amazing on the wedding day for photos with my girls getting ready! 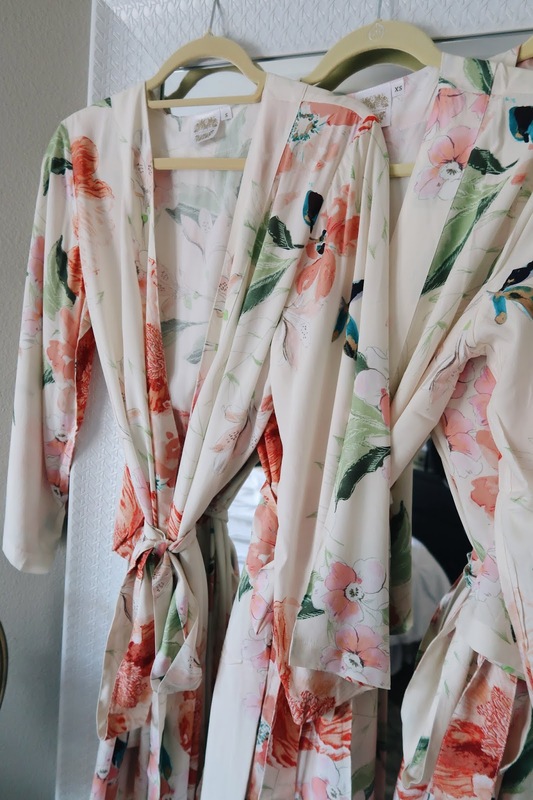 Now I have to take a moment to share my love for BHLDN and their bridesmaid robes/gift options! I mean, how GORGEOUS are these robes?! The white robe and chemise that I am wearing is also from BHLDN, and I can't wait to wear it on the wedding day. If you're looking for the perfect earrings or other trinkets, you can check out their website here. I highly recommend BHLDN for all of your gift and outfit needs, as their quality is amazing!! 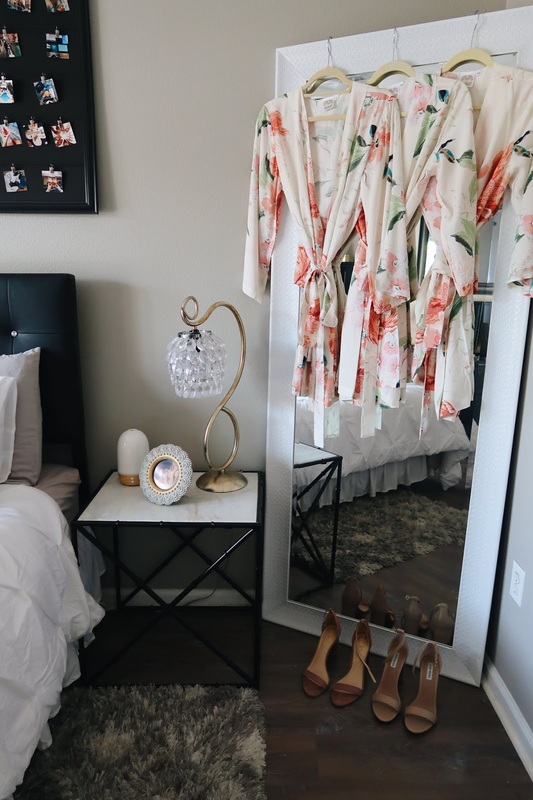 I will definitely be shopping here for an outfit for my bridal shower and rehearsal dinner, bridesmaid earrings and maybe even my wedding dress! If you're looking for beautiful custom cards, I designed these from Minted! We LOVE Minted and are using them for other wedding printables that we need, but had to share these darling cards and even small votives that I'll be throwing in gift bags for the wedding day. Earrings or other jewelry items - to wear during the wedding! Nail polish - make it a color they can wear for the wedding! Luggage tags - cute for a destination wedding! At the end of the day, don't stress about this step! Your girls are going to be so excited to be a part of the big day! Keep in mind that there are so many other elements of the wedding to come, so be sure to stay within your means for this first task. Such a cute idea! I love confetti poppers too! So cute!! I asked my sister with knot earrings, hair ties (to have & to hold your hair back), a candle & balloons? She loved it!